Online Application Details for Chennai Corporation Recruitment of 31 Assistant Engineer (Civil) and 71 Sanitary Inspector is given below. 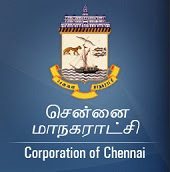 Application form and duly attested documents are to be sent to The Commissioner, Corporation of Chennai, Amma Maligai, (Ripon Building campus) No.16, E.V.R.Salai, Chennai-600 003. In envelope super scribed with 'Application for the Post of Post Name'.